This article was originally posted on Elizabeth Lockwood’s LinkedIn page and is posted here with the authors’ permission. Deaf Vietnamese leaders Huong and Linh share their knowledge about the situation of Deaf people in Vietnam. 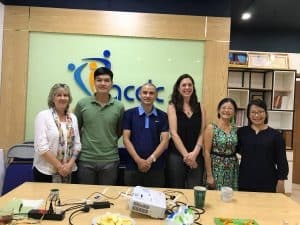 Recently Sian Tesni, Senior Education Advisor at CBM, and I had the fantastic opportunity to meet with deaf leaders in Vietnam. We met with dynamic leaders, Ling from Hanoi and Huong from Ho Chi Minh City. We were able to learn some history of the Deaf community and also the myriad barriers deaf and hard of hearing encounter in Vietnam. The following is a summary of what we learned, which is only a glimpse of this rich culture. We hope to work more with this community in the future. The first deaf school in the country was established in 1886 in the South of Vietnam. At the end of the war in Vietnam in 1976, the first school for deaf children was established in the north in Haiphong City with the fist school for deaf children in Hanoi established the following year in 1977. These schools used sign language indeed sign language was used in schools for deaf children throughout Vietnam. In 1990 Dutch missionaries arrived in Vietnam and spread the oral method of educating deaf children, which spread throughout the country and consequently removing sign language as a primary source of communication. In 2000 Professor James Woodward established a sign language program in Vietnam with the support of the Nippon Foundation. He was director of the project “Opening University Education to Deaf People in Viet Nam” at the Dong Nai Provincial Department of Education and Training. This program brought back sign language use in Vietnam and provided opportunities for empowerment for deaf leaders such as Lin. In 2001, Lin left the oral school where he was a student and instead attended Woodward’s sign language program. Since then, Lin has become a formidable leader in the Deaf community. 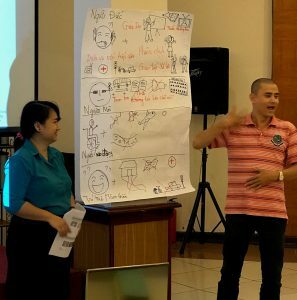 Lin empowers other deaf leaders as well, such as Huong whom he met and to whom he taught sign language. Now she is another empowered deaf leader in Ho Chi Minh City. CBM representatives meet Deaf Vietnamese leaders Huong and Linh. Currently there are 100 schools for deaf children in the country and 27 deaf students have graduated with a college or university degree. There are currently three deaf teachers in Hanoi and two in Dan Nang. There are many barriers for deaf and hard of hearing people to have equal access into Vietnamese society. There is lack of access to information. 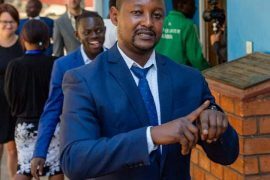 In the entire country there are only 10 sign language interpreters, and all are unpaid, as the government does not provide these services or fund interpreters. In addition, as of yet, there is no formal sign language interpreting program and Vietnamese Sign Language is not recognized by the government. There are no interpreters or closed captions on television, no interpreters in universities, or for public services, including healthcare services. Not having interpreters in medical settings leads to lack of access to important healthcare information. This can be a frightening situation to be in. One example given was that a deaf couple went to the doctor for a routine checkup since the woman was pregnant. The healthcare personnel thought she was there to get an abortion instead. Fortunately the couple realized this grave error in time and received the appropriate healthcare attention they wanted. In addition, deaf people are not permitted to get driver’s licenses, which creates another barrier and deprives and restricts access to essential services, employment and social opportunities. The World Federation of the Deaf (2016) indicates that deafness does not in any way limit a person’s ability to drive a car or other vehicles. Globally, there are no known reports that deaf drivers are a threat to other road users or that they are involved in more traffic accidents or injuries than the general population. On the contrary, according to studies, deaf drivers are involved in fewer car accidents than the average driver. Keeping in line with the UN Convention on the Rights of Persons with Disabilities and the 2030 Agenda for Sustainable Development, all persons with disabilities are guaranteed their full enjoyment of human rights without discrimination with the commitment to leave no one behind. This includes those furthest behind, such as deaf people in Vietnam. Watch a former President tell about his experience working with a volunteer that ended in a conflict. Frank Musukwa explains how Deaf organizations in Zambia advocated with local universities to ask them to enroll Deaf law students. MNI staff works with the Nawalparasi Association of the Deaf in Nepal, South Asia, to observe and assist with their empowerment training workshop. This is a bilingual website using English and International Sign. Soon we will to have other languages (signed and written), too.